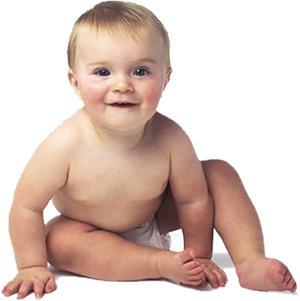 Poopy diapers and stinky sneakers beware! You finally have a safe way to eliminate odors from people and their smelly stuff! If you've been wary of odor eliminators with questionable ingredients, or you're tired of wasting money on those that really don't work, now you can breathe easier… literally. PureAyre really works, yet it's all natural and safe enough to spray directly on and around people. According to the U.S. Environmental Protection Agency, the #1 pollution problem in our country is indoor air pollution. We've mastered the airtight and energy efficient building, but is that good news? Levels of many pollutants in the typical home and office are at least 10 times higher than in outdoor air, and the average American spends 90% of their time indoors. These airtight structures not only keep fresh air out, but they trap fumes from paints, cleansers, carpets, glues, pressed board, fabrics and other chemicals in your home or office for you to breathe in all day and night. Many odor eliminator alternatives just cover up odors with other smells, tricking you into thinking the odor is gone. When the odor comes from a toxic source, this is dangerous. Volatile organic compounds (VOCs) like formaldehyde, pesticides, solvents and cleaning agents can make you sick, but if you don't smell them, you don't know you're being affected by them. Sometimes it's the products in your home that are making you sick. Don't fill your home or office with yet another dangerous substance. 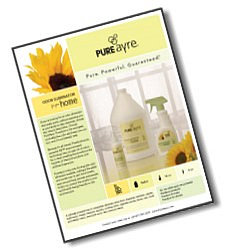 Eliminate the odors and the pollutants altogether with PureAyre and breathe pure air.